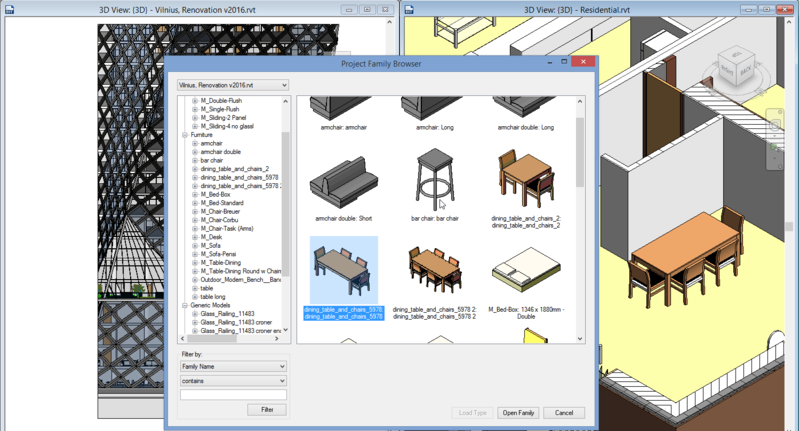 How to Easily Use and Manage Revit® Families? None of Autodesk® Revit® users can avoid working with Revit families. Depending on project size and complexity, either more or less of family files can be used; therefore Revit family library, as well as storage, size may vary. Usually Revit families are stored on designer’s computer, or, when there are lots of Revit elements in a company, they can be stored on company server. t takes time to select Revit object from a library, even more time is consumed by editing process of families already loaded into a project. Therefore, most Revit users are looking for ways to speed up these processes. 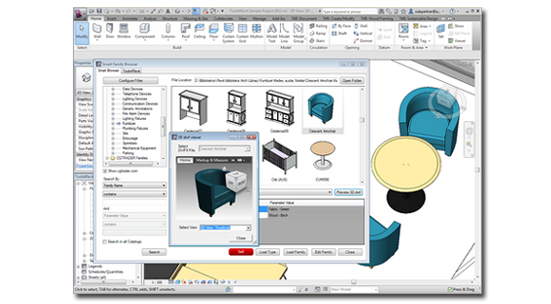 Revit add-ons and applications, developed by AGACAD, can greatly facilitate designers’ work. AGACAD offers the market multiple Revit extensions, which help to quickly find required Revit families on designer’s computer or server, searching by family name, type, parameter name or values. Smart Browser Free, Smart Browser Power and Smart Browser Simple – they all look very much alike, however the opportunities they provide vary. All three products share the same objectives, finding Revit families in a library, making sure it is suitable and loading it to a project. The main differences are in Browser Options. Using Smart Browser Simple, designer can only view families in the library, select the required ones and load them into a project. That is all it can do. Smart Browser Power user can do much more: not only find required Revit objects, but add more families to the library and synchronize performed changes. He can create a new library or modify an existing one, use not only company but also his own library. Thus, the main difference between the two tools – Power user has more rights than Simple user does. Free Revit plug-in Smart Browser Free has the same features as Smart Browser Power, however the free license is intended for single users (single-user license), there is no network (multi-user license) version of this product. That is, Smart Browser Free does not suit a big company, this is a product intended for private designers. Company with more designers usually has a need of network license, thus Smart Browser Power and Smart Browser Simple products are intended for larger companies. Their network licenses allow specifying user rights. For example, network administrator indicates that 10 out of 100 employees will be Smart Browser Power users, while all the others will use Smart Browser Simple, which provides a little less features, but helps avoiding designers’ self-will when loading any elements into the project. Furthermore, Smart Browser Free doesn’t have a feature, which finds differences between Revit project families and families in a selected library. This feature lets users make sure that project always has suitable families that are up to date. Application for Revit Smart Browser Manage allows doing absolutely anything: search Revit families and work with them, synchronize changes in a library and also modify the library elements. It has additional features, which allow users to add/remove any family parameter, add or edit formulas and perform other Revit family adjustments. Smart Browser Manage allows modification of one or even hundreds of elements at a time, user just has to specify which families’ parameters and what parameters should be added/changed/removed, the adjustment process is launched automatically. Smart Browser Manage license can be issued as either single-user or network, thus companies have the freedom to choose depending on their needs. If a company has up to 20 employees, it is enough to install one/two Smart Browser Manage licenses and their users will modify the elements, while all other designers can use free of charge Smart Browser Free licenses. It makes sense to use all three types of Smart Browser product network licenses in larger design companies. Let’s say, there are over 20 employees in a company, in this case, it would be best to choose network Smart Browser Power or Smart Browser Simple licenses and a few Smart Browser Manage licenses. If, for example, company has 100 designers, then 3 of them could be Smart Browser Manage users, 10 could work with Smart Browser Power, while all the others are Smart Browser Simple users. All of them use the library; however they have different user rights. The first 3 have the most rights and can adjust library elements, 10 Smart Browser Power users can synchronize library (i.e. add more elements, have a separate library, not just a company library), while Smart Browser Simple users only open library and easily find elements they require. add, modify, and delete text formulas and much more.